We survived the zombie apocalypse, but how many of us are still haunted by that terrible time? We have (temporarily?) defeated the living dead, but at what cost? Told in the haunting and riveting voices of the men and women who witnessed the horror firsthand, World War Z is the only record of the plague years. Even with all of the excitement of the new movie coming out, I still wasn’t finding myself searching out a copy of the book. It wasn’t until I was home visiting with my parents and brothers that my one brother told me they had a copy of the book. This came up as I mentioned that I was going to be looking for a new book to read, and my brother, who had already read World War Z, told me they had a copy at the house and I could borrow it. So here I was, presented with a copy of the book…there was nothing to keep me from reading it at this point. I decided to go ahead and give World War Z my best reading effort. 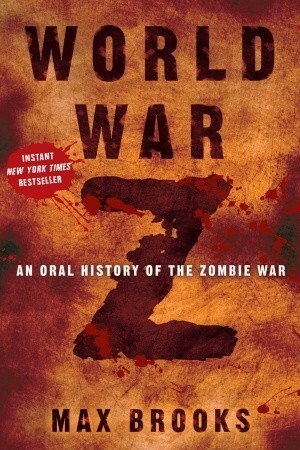 While the entire title of the book, World War Z: An Oral History of the Zombie War, suggests the format of the novel, I still wasn’t sure what to expect from a book that was essentially a compilation of interviews. I found that this format, even though it took me a few interviews to adjust to, was the best way to convey all of the voices that were the “survivors” of the Zombie War. It was through the format of putting together the oral history that the reader is able to get a complete picture of what it was like for people before, during and in the aftermath of the War. By including the different voices, different locations and the varying jobs and experiences, the audience is able to piece together the global experience and how unprepared the world had become. Max Brooks does a great job of taking “historical” (for most of us, more recent events) and intertwining them into the story to allow the audience to find a connection to the characters and events of the Zombie War. I believe that without including these (but without using names or events that are too recent) the reader would not find that same connection; the audience would be disconnected and not feel as though this would ever be able to happen. Now, don’t get me wrong, I am not among those who believe that we will ever have a Zombie war, but while reading this novel, you do not find it as un-believable as maybe you did before starting the book. Not only does World War Z illustrate the importance of keeping an oral history of our events in history (the Library of Congress is doing a great job working on the Veteran’s History Project by collecting interviews with Vets), but it shows how people behave and what we do when human nature takes over. This novel shows how flawed human nature is and what happens when our prejudices get in the way of the greater good. Brooks was able to accurately show the frustration, the helplessness and even the anger that many of these survivors felt. The narrator (the journalist) does not try to “sugar-coat” the event, but instead wants to show the full range of successes and failures during the war by using the interviewees’ own words. It shows us that while governments may believe that witholding information is for the best of everyone, that belief sometimes backfires. (Not to get into any political debate.) Max Brooks was able to create a depth of not only information, but feeling as well, as he showed the desperation of those involved in the war. To my (honest) surprise, I really enjoyed reading World War Z. I believe that this book does a great job of presenting a fictional event as a historical one, but isn’t so far “out there” that the story is not believable. I would recommend this novel to everyone, including those who have not been caught up in the Zombie craze. It’s a great read and Max Brooks, as I mentioned before, does a fantastic job with the depth of information he has created through the different interviews. If you find yourself near a copy of World War Z, I would suggest to you….go ahead, pick it up, and read it.